There was a time when the only option for people with strong prescriptions was a pair of glasses with thick, coke-bottle lenses and a resignation from ever looking cool again. Thankfully, modern technology and the demand for better lenses has driven the optical industry to create high index lenses. What is the Refractive Index of High Index Lenses? High index lenses have a refractive index above that of plastic or polycarbonate lenses. The refractive index of a lens is its efficiency in bending light. Corrective eyeglasses lenses improve your vision by bending light to compensate for myopia (nearsightedness), hyperopia (farsightedness), or astigmatism. With a higher prescription, you need more material, and therefore a thicker lens, to compensate for your eyes. A high index lens can bend the same amount of light as a plastic or polycarbonate lens while using less material, so you end up with a thinner lens. This also tends to reduce the “bug-eye” look from strong prescriptions. What do High Index Lenses Cost? High index lenses are generally more expensive than regular plastic or polycarbonate lenses due to the cost of the lens material and the technology that goes into manufacturing it. High index lens material is also more sensitive to manufacturing defects, so an optical lab needs to use special care to make sure the prescription comes out right. This adds to the overhead labor costs associated with making the glasses. Fortunately, highly affordable online eyewear stores have sprung up in recent years which supply prescriptions with high index lens material for a fraction of what you’d pay at the eye doctor. How to Order High Index Glasses Online? 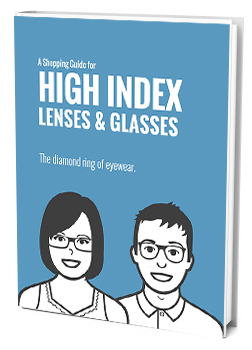 When ordering high index lenses online, it is important to ensure that you enter your prescription in correctly. This means entering the positive numbers as positive and negative as negative. It is also important to pay attention to the decimal places in your prescription (-0.25 vs -2.50) and the measurements that your eye doctor may or may not have entered on your prescription (such as pupil distance). A good rule of thumb is to check out the FAQ section of whatever web site you’re on if you have any questions, or to call their customer service department. A few things that the eye doctor wasn’t fibbing about when he said you “need” them: anti-reflective coating (AR coating) and scratch coating. An anti-reflective coating is pretty essential for high index lenses because the nature of the lenses’ ability to bend light efficiently also causes them to reflect a lot of light. Without AR coating, you will experience a lot of bothersome reflections and glare which could be dangerous while driving or operating machinery. And scratch coating is a good choice on any pair of lenses except glass, which is naturally very hard and scratch-resistant. What are Ultra High Index Lenses? High index lenses which are marked as having a refractive index above 1.74 are considered to be “ultra high index.” These lenses are as thin as it gets. Most high index lenses at or above 1.80 are glass, which can get up to a refractive index of 1.90. People with especially high prescriptions (+/- 6.00D) would be best off with ultra high index lenses. What are High Index Sunglasses? With all of the advancements in lens technologies, it’s no surprise that now you can get tinted, polarized, or photochromic (such as Transitions®) sunglasses with high index prescription lenses, even in wraparound-style frames. While these may be more expensive than traditional prescription glasses, they are worth the cost if your are spending a lot of time outdoors because they protect your eyes from harmful rays from the sun.